The Western Bluebird was once a common site on Vancouver Island. This brilliantly-coloured bird species thrived here and on the neighbouring Gulf Islands until the 1950’s, when their numbers began to steadily decline. By the 1990s, bluebirds were no longer breeding in southwestern BC, and were soon considered to be extirpated (locally extinct). What caused this once prolific species to disappear? The primary factor is likely habitat loss. Bluebirds are secondary cavity nesters, meaning they rely on holes left by woodpeckers in standing deadwood to build their nests. If most of these dead trees are removed (either through logging practices or urban development), the birds are left with little in the way of natural nesting habitat. Bluebirds face steep competition for the few remaining cavities, as these are also sought after by introduced species such as starlings and house sparrows. Human activity has undoubtedly impacted the bluebirds’ distribution, but there is good reason to believe that human intervention will help return the species to its former range. 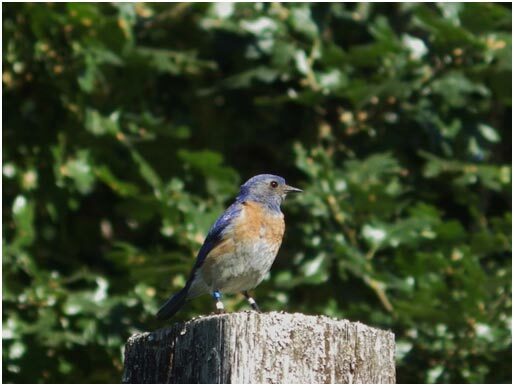 The Garry Oak Ecosystems Recovery Team is working to restore self-sustaining Western Bluebird populations on Vancouver Island and the Southern Gulf Islands through the HCTF-funded Bring Back the Bluebirds project. The project team has been translocating breeding pairs to the Cowichan Valley and creating habitat for them by mounting nestboxes in prime foraging locations. The first year of the project (2012) resulted in the successful fledging of the first bluebirds known to have hatched on Vancouver Island since 1995. The project plans to translocate a total of 90 adult bluebirds over the course of 5 years. The following video by Shaw TV provides an overview of the project, including footage of a pair of bluebirds being released from their aviary at Cowichan Garry Oak Preserve. Want to be involved in this project? Visit GOERT’s website to learn how to identify Western Bluebirds, report bluebird sightings, or get information about nestbox hosting or monitoring programs.